**A docking station is not required for downloading data and configuring devices with the VFC400-USB. The VFC400-USB connects to a computer USB port for easy configuration by the user for a wide range of recording and alert conditions. provides an immediate indication - without access to a PC - if any readings are outside the limits specified at the time the unit was configured. Automatically generates an encrypted data file - for a more detailed analysis and to comply with FDA CFR21 Part 11. Accuracy Calibrated accuracy of ±0.3 Deg C from +99 to -40°C. Alarming Audible and visual alarm for out-of-range temperatures. USB 2.0 / Micro USB Socket. Recording capacity Memory storage of 16,129 readings. Logging rate User programmable logging rate from every 30 seconds to 18 hours. Remote Probe Removable remote probe mounted in a shatter proof bottle in glycol solution. Sensor cable lengths Standard 5' long. Certification Certificate of Calibration NIST traceable, compliant to ISO 17025:2005. Download time Typically less than 10 seconds. Typically 12 months of operation (CR2032). AAA battery also up to 12 months. 5V via micro USB socket or, 2 x 1.5V AAA alkaline batteries. CR2032 LiMg coin cell (backup logging function only). Record inspection marks at the push of a button. External Probe with high quality gold plated connector. It takes less than 10 seconds to download the data. 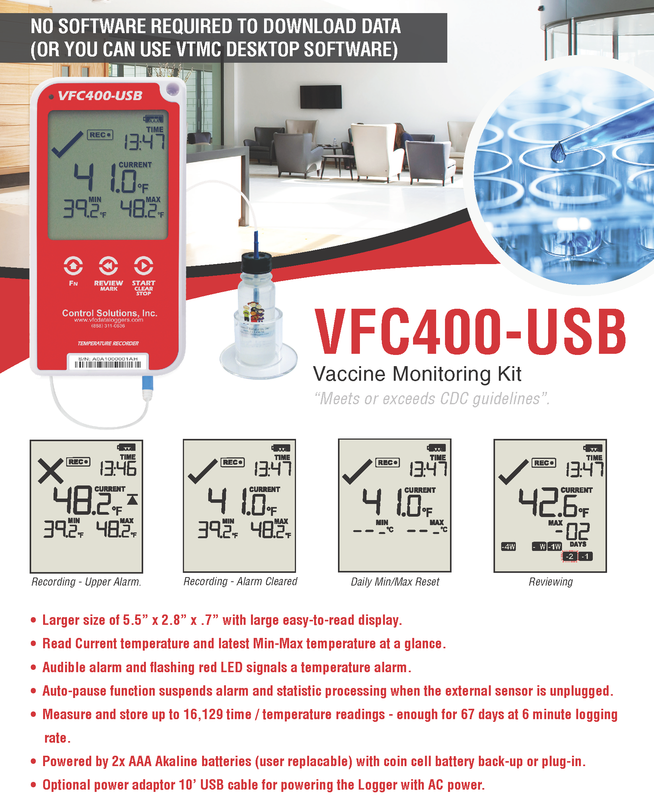 The VFC 400 meets and exceeds all the CDC's recommendations for data loggers as listed below. 1. Provide continuous monitoring information with an active display. 2. Be a digital thermometer with a probe in a glycol-filled bottle. 3. Include an alarm for out- of- range temperatures. 4. Have a reset button if using a data logger with a min/max display. 5. Be capable of showing current temperature as well as minimum and maximum temperatures. 6. Be within +/-.5°C accuracy (+/°F). 7. Have a low battery indicator.